Colin McMullan is an interdisciplinary social practice artist interested in research and collaborative work involving wild foods, indigeneity, environmental justice, and decolonization. Experimental Research On The Nonexistence of Borders is a video installation work, in which an American field research scientist character performs experiments to prove the insubstantiality of political barriers from a natural law perspective. 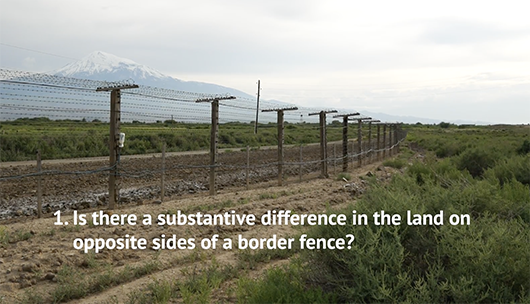 The video was produced on location at the fence on the closed border between Armenia and Turkey. This video is a part of a series of works utilizing humor and pathos to question the legitimacy of political borders and promote transnational identity formation. Colin performs as a somewhat obstinate, naive professor, conducting field research experiments to prove that borders have no meaningful impact on soil, air, water, flora, fauna, and human populations in the border region. The conceit of the work is that natural law defies the limitations of human legal constructs. Political borders are intangible, ephemeral, imaginary, contrived, and highly permeable. Biological populations in border zones, including humans, are often at some liberty to defy these abstract limitations in service of greater, simpler truths. The Experimental Research On The Nonexistence of Borders video will be accompanied by a short video on the concurrent social art project, Tree Spa for Urban Forest Healing, which will take place from Saturday, March 16 through Saturday, March 23. Emcee C.M., Master of None is the pseudonym of Colin McMullan. He has a practice of active, cooperative, social, public art often utilizing vehicles, play, conversation, moving pictures, publications, and food, for which he has received institutional support from LMCC, IPG, CAG, ISCP, CUE, CBA, BHK, BBBP, Eyelevel BQE, ICA Yerevan, Smack Mellon, Skowhegan, Bronx Museum, Queens Museum, Flux Factory, the Aldrich, Artspace, i-park, el Taller Boricua, and Real Art Ways. He is currently based in Hartford, Connecticut, performing transnational “Experimental Research on the Nonexistence of Borders,” and operating the “Tree Spa for Urban Forest Healing.” Recent professional highlights include shows at Dorsky Gallery in New York, Real Art Ways in Hartford, the Museum of Modern Art in Yerevan.